Originally published under the title, "ISIS' Shocking Assault on History." Members of ISIS use sledgehammers to destroy a statue at Mosul Museum in an undated video made public by the group last month. 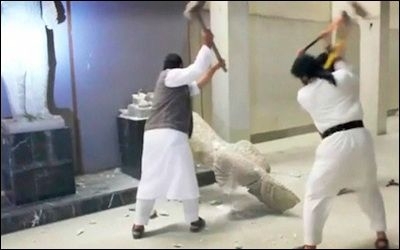 The terrible spectacle of Islamic State (ISIS) members destroying ancient Mesopotamian statuary in the Mosul Museum and at the Assyrian site of Nimrud has shocked the world, as intended. These actions were met with swift condemnation from the world's scholars and cultural authorities, as well as its political authorities. To Western eyes, the perpetrators' self-evident glee was especially bizarre. From childhood, we are taught to tread carefully in museums lest we damage artifacts. So what comes next for archeological treasures in the Middle East? Oh Muslims, the remains that you see behind me are the idols of peoples of previous centuries, which were worshipped instead of Allah. The Assyrians, Akkadians, and others took for themselves gods of rain, of agriculture, and of war, and worshipped them along with Allah, and tried to appease them with all kinds of sacrifices. The Prophet Muhammad shattered the idols with his own honorable hands, when he conquered Mecca. The Prophet Muhammad commanded us to shatter and destroy statues. This is what his companions did later on, when they conquered lands. Since Allah commanded us to shatter and destroy these statues, idols, and remains, it is easy for us to obey, and we do not care [what people think], even if this costs billions of dollars. As the destruction unfolded the video subtitles made the point clearer still, with a quote from the Qur'an: "He reduced them to fragments" [21:58]. The subtitles continued by stating: "these idols and statues were not visible in the days of the Prophet Muhammad and his companions, but were extracted by the worshippers of devils." Iconoclasm and the condemnation of idolatry are, from an orthodox Islamic point of view, perfectly permissible and unassailable. According to the Qur'an, "whoever associates partners to God is indeed guilty of a very grave sin" [4:48]. In the Hadith collection of Bukhari, Muhammad himself is quoted as saying: "the makers of these pictures will be punished on the Day of Resurrection, and it will be said to them, 'Give life to what you have created.'" Additionally, the Prophet said that "the Angels of Mercy do not enter a house in which there are pictures (of animals)" [Bukhari 7:62:110]. No Western scholar can deny these lines. Iconoclasm is, from an orthodox Islamic point of view, perfectly permissible. In fact, beheadings, the buying and selling of slaves, and the slaughter of infidels are all distinguishing features of ISIS and the early Islamic conquests they so consciously emulate. The rationale for these activities are carefully explained by ISIS' Islamic thinkers, but their arguments are ignored by Western political leaders like President Obama, who arrogate the right to determine what is and is not Islamic. In the cultural sphere, this attitude is exemplified by two Biblical scholars who argue that ISIS is "acting like all cultural conquerors." They then quickly point to Christian iconoclasm of a millennium ago, and argue that the West "should not, however, attribute it [ISIS]to militant Islam—even if the militant Islamists say so themselves." Indeed, conquerors from all periods have periodically erased images of their predecessors, not least of all in the Middle East, where the faces of royal statues were among the first items ritually desecrated during wars or rebellions. The bronze head of Sargon of Akkad in the Iraq Museum is an especially poignant example; it stares with a mutilated eye that once gazed at the world's first territorial state. But it pays ISIS too little respect to say their actions have "nothing to do with Islam." In fact, statues from the Parthian city of Hatra were recently destroyed, along with monumental Assyrian statues at the site of Nineveh. These now join the Buddhas of Bamiyan, the manuscripts at Timbuktu, and countless other mosques, shrines, tombs, temples, and churches across Syria, Iraq, Egypt, and Libya that have been systematically destroyed by militant Islamists. Together, they form a war against the past. This war cuts at the heart of the belief that the past is something to be treasured and shared as it serves a role in uniting people around a common narrative. The Islamic State clearly repudiates this and has clearly explained its early Islamic models, those who, according to ISIS' proclamation of the Caliphate "abandoned nationalism and the calls of jāhiliyyah (pre-Islamic ignorance), raised the flag of lā ilāha ill Allāh (there is no god but Allah) and carried out jihad in the path of Allah with truthfulness and sincerity. So Allah raised them through this religion and honored them by having them carry its message. He bestowed His grace on them, and made them the kings and masters of the world." Against this, scholars of antiquity have fallen short. UNESCO chairperson Irina Borokova has characterized the attack as "far more than a cultural tragedy. This is also a security issue as it fuels sectarianism, violent extremism and conflict in Iraq" and plaintively called for "an emergency meeting of the Security Council on the protection of Iraq's cultural heritage as an integral element for the country's security." The logic espoused by the Islamic State makes it immune to UN resolutions and the threat of sanctions. She is correct, but her words have had little impact. While petitions have been signed and statements of protest posted, the logic that the Islamic State espouses makes it immune to overtures, demands, negotiations, international law, UN resolutions, and the threat of sanctions, all normal coercive tools of international relations that would ordinarily work. Short of military force, there is little to be done to preserve ancient sites in Iraq. Also frightening to cultural experts is that none of their traditional arguments about the need to preserve archaeological resources and heritage sites have any hope of gaining traction among ISIS militants. For the Islamic State, the past is neither an object of national pride or even interest. Nor is the past part of the common heritage of mankind, according to them. For ISI, art is idolatry, sacrilege in material form, and an impediment to the Islamic utopia they strive for. What archaeologist or historian is equipped to argue with that? Previous Islamic states and rulers permitted the existence of ancient cities and relics. To us, this proves their humanity, cosmopolitanism, and the subtlety of their Islamic argumentation. But to the Islamic State, it merely proves that they were not good Muslims. Now with bulldozers, jackhammers and explosives, ISIS can remake the past as it should have been, a tabula rasa, or jāhiliyyah undone, a kind of Muslim Year Zero. All the better that it is broadcast to a hapless world. Perhaps better Islamic arguments, from Muslims, would be persuasive. Perhaps not. It was not supposed to be this way. Local societies were supposed to conserve the ancient past in order to establish a new basis for multicultural life in the present. Ancient relics were supposed to neither be a commodity, to be mined for salable value, nor a target of destruction. Alas, the reactionary trend typified by ISIS has proven too powerful. What remains is a painful conundrum for scholars, and a bloodbath for Syrians, Iraqis, Libyans, and Yemenis, particularly those of the wrong faith or sect. Nobody is willing to go to war to save antiquities and the West remains unwilling to do so for living people. Saving both will require more. Perhaps this knowledge is the ultimate source of unease for history scholars, lay people and leaders alike. Alex Joffe is editor of The Ancient Near East Today, the monthly e-newsletter of the American Schools of Oriental Research. He is also a Shillman-Ginsburg Fellow at the Middle East Forum.